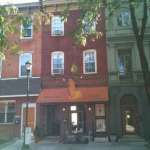 Novita Bistro opened in Philadelphia, Pennsylvania in 2008, on the 1600 block of South Street in the Graduate Hospital area of Center City. At first, Novita Bistro appeared as though it would be just another Italian-themed BYOB in an already saturated market in Philadelphia. With time and a little fine-tuning of the menu, owners Hatim Saaboul and Hassan Zanzoul (also head chef) focused the restaurant on Moroccan-inspired cuisine, the food of Zanzoul’s homeland. Zanzoul previously worked as a chef in Italy from 1987 until 1996, after which time he received formal training at the French Culinary Institute in New York City. His training and expertise, honed while serving as Executive Chef at the Silver Spoon Cafe in Branchbug, New Jersey, shine through in his menu and the delightful cooking at Novita Bistro. 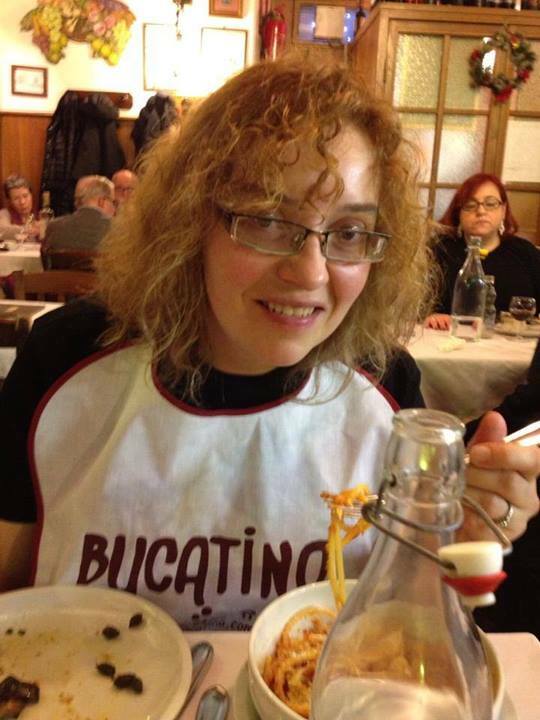 I have dined at this BYOB on four occasions to date and always been highly satisfied by the experience. The interior of Novita Bistro is fairly typical of Philadelphia, Pennsylvania’s BYOBs. A small first-floor storefront has been converted into a narrow dining room, with an open kitchen in the back. The room is painted in warm earth-tones, with a tiled floor and one brick-faced wall. Late in the evening, the room can become a bit dark and could perhaps use a little more lighting. During good weather, a few tables are offered outside on South Street, although the neighborhood does not offer the most attractive view for alfresco dining. Novita Bistro’s regular menu is brief, but with a tempting array of dishes offered. Appetizers range from $9-$12 and include choices such as Seared Diver Scallops with a Wild Mushroom Compote, and Mussels served with Shallots in a butter, herb and white wine broth. One of their most outstanding appetizers is the Fried Calamari with Hot Cherry Peppers and Balsamic Reduction, which I have already written about in my article “20 Things You Must Eat in Philadelphia, Pennsylvania.” This generous bowl of crispy, tender fried calamari rings in a sweet balsamic glaze is truly amazing. 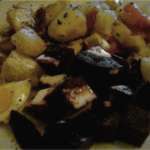 Several salads are also offered as starters for $8-$9, including an excellent Moroccan Salad. 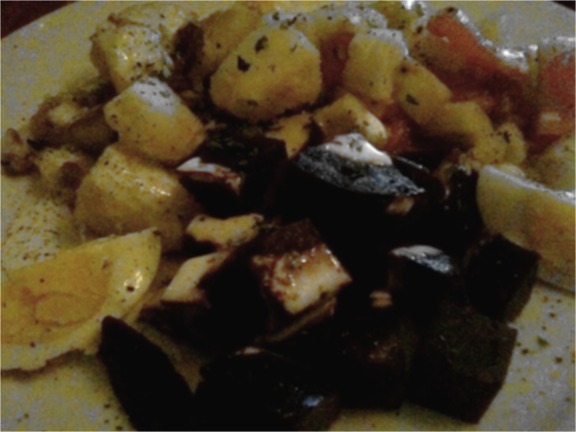 This large plate includes red beets, potatoes, tomatoes, cucumbers and egg in an olive oil vinaigrette. Entrees range in price from $14-$23. Choices include a traditional Merguez, described as “Homemade Moroccan lamb sausage and shrimp brioche marinated in charmoula and served with couscous and vegetables.” The sausage is delicious and garlic-rich, and pairs extremely well with the lightly seasoned grilled shrimp. There is also a Moroccan tagine of braised chicken with green olives, potatoes and preserved lemon, and often lamb tagine is offered as a special of the night. 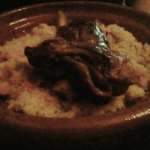 The tagines are worth trying, as they are served in traditional Moroccan dishware and rich with complex, temping spices. A boneless, spiced Cornish Hen makes for a very generous dinner, served with escarole and cannellini beans. I have also enjoyed an excellent, succulent grilled swordfish steak as a special for the night.Side dishes are also available for $6 each, and include marinated olives, sauteed spinach, and Tuscan-style white beans. Sweets are not especially a strong suit at Novita Bistro. Desserts are not a large part of Moroccan cuisine to begin with, so I would skip them here, as I have been somewhat disappointed by dry tarts and other less-than-stellar final courses in the past. 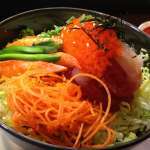 Service is typically very friendly and warm, if occasionally a little unpolished. The young waitstaff tries hard and does well on slow, quiet evenings, but sometimes seems a little overwhelmed when the restaurant is too busy. Go early and you may have a chance to talk with Chef Zanzoul himself more about Moroccan cooking, and perhaps even enjoy a glass of Sambuca on the house to finish your meal. The restaurant will also happily handle large parties and fixed-price menus, so if you are looking for a unique place for an event, contact them for more information. 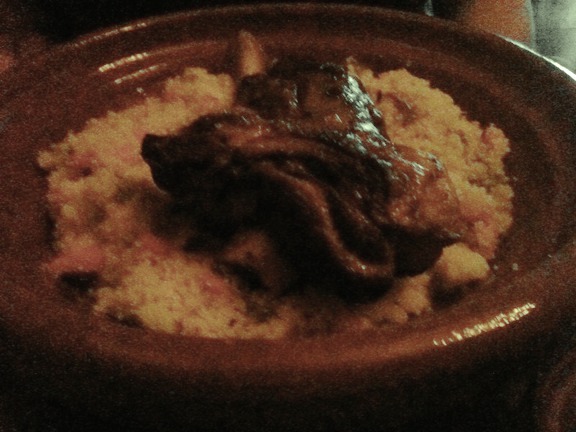 In conclusion, Novita Bistro offers diners in Philadelphia, Pennsylvania an excellent opportunity to enjoy Moroccan cuisine with an Italian/French-flair. A typical meal for two, including starters, entrees and perhaps coffee or a shared dessert should cost no more than $70-80 before tip, quite reasonable and on par with the Center City and Graduate Hospital’s other BYOB establishments. This review was originally published May 25, 2010 at the Yahoo! Contributors Network. Novita Bistro closed in August 2013 and the space at 1608 South Street is now occupied by Entree BYOB. 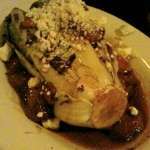 This entry was posted in Philadelphia restaurants and tagged byob, graduate hospital, moroccan food, novita bistro, philadelphia, restaurant review. Bookmark the permalink.